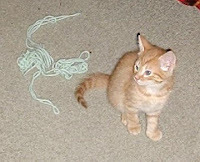 In this case, the three blondes in question are the golden tabbies in the Frieda Farrell's Litter of 5: they had been named generically Abel, Baker & Charlie. They took time out from their active schedule recently to pose for pictures. Charlie is the Great Purrer, usually the first one to greet me when I come into their bedroom, feeding time or not. He is lobbying hard to be kept, always showing me how cute he can be. In this picture, he's making one last primp to look good for the camera as Baker tells him to sit up "or we'll be here all day." In the next shot, Abel, who has turned into an expert belly-rubber (or perhaps the right word would be 'rubbee') and who's become something of the class comic, advises Charlie to move over "just a bit" because he's covering Baker. And then the last shot, taken before they all took off in three different directions, is one like many parents get with their kids, finally, completely bored with the whole camera thing. But it was amazing that they stayed in one place long enough that I was able to snap the pictures I got! Baker is getting over being the Aloof One and has recently been seen eating canned food: he was the last one to be fully weaned, caught eating adult dry food when he was 53 days old but never coming out of hiding to eat with the rest of them. I thought perhaps he might turn out to be a drybivore (one who eats only dry bits) though in the past couple of days he has been spotted chowing down on a plate of Chicken & Tuna, proving that he can be a canivore, as well. I wouldn't mind any of them being drybivores since I have to put down bowls of each for the other cats already, but we'll see how they develop. Baker is also getting more acclimated to being picked up and held, a move that would have had him running for cover last week, still. Perhaps a few chin scratches and belly rubs helped him overcome the advice his mom had given them about the Big People. 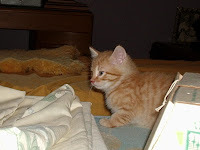 It's amazing, after handling these little furballs, how big my other cats seem. They haven't been fully introduced yet though Max managed to sneak into the room when the door blew open after not having been latched properly: he ran back out into the hallway as if he'd just discovered the room was full of these tiny manic fur-covered energy fields bouncing around all over the place (he probably thought there might have been 20 of them, judging from his expression). They will be 8 weeks old on Monday and their energy level increases exponentially with each passing week. It's been a quiet weekend for the most part, since I've been trying to rest my "pulled muscle and hernia" -- the doctor said I shouldn't be lifting anything over 10 pounds which means, I guess, I can't read that new translation of Tolstoy's "War & Peace" I got the other month... Now that I've finished Kiran Desai's "The Inheritance of Loss," I started looking around for something else to read and decided to pick up where I'd left off in Dostoyevsky's "The Idiot." 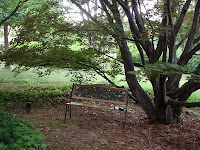 Curiously, I sat down on the garden bench underneath the spreading Japanese maple (the one that 45 years ago looked like a tiny stick in the middle of the yard) and began reading a paragraph that began "He thought about that, sitting on a bench under a tree in the Summer Garden." Easily distracted by watching the chipmunk on the porch and the birds at the feeder, there wasn't much to think about on a beautiful mild Sunday afternoon. It had never occurred to me, for instance, that kittens apparently learn to purr. 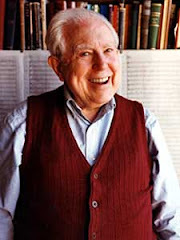 Friday night was the first I heard any of them purring – Charlie, first, who then on Saturday velcroed his way up onto the ugly chair beside me, nestled down beside me and began purring like a miniature outboard motor. 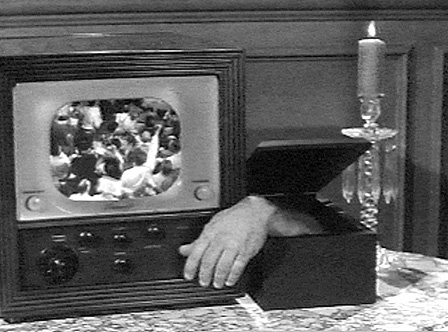 Later, Blanche did the same thing, though not as loud. Here is Abel checking things out from the arm of the ugly chair This chair, over 60 years old and still with most of its original stuffing if not upholstery, is covered by a couple of strikingly conflicting throws (I should perhaps do something about that) including a strangely yellow sheep-skin we’d once used to make my dad’s wheel-chair more comfortable for him. 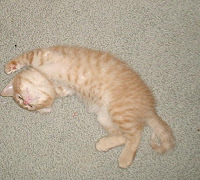 Regardless, it has become a center of kittentivity from climbing and clamboring to resting and observing. Once in a while, when I manage to sneak into the room, I will find two or three of them curled up on the seat sleeping but of course they’re usually up and at my feet before I get the camera warmed up and ready to go. Baker, meanwhile, remains elusive, usually back by Frieda’s side. Last night, he came out to play with the other kittens, but he still runs from me whenever I approach him. I was concerned that he was still nursing since I’ve never actually seen him eat adult food from one of the bowls, but some of the cat books I have mention kittens are weaned between 40 and 50 days’ old. 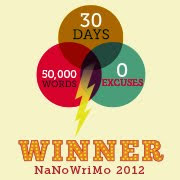 And they’ll be 50 days old on Monday. It’s just odd, considering Charlie and Blanche started eating some of Frieda’s canned food on Day 31, Blanche even crunching away on adult dry bits later the same day! I’m still having problems getting used to calling the kitten previously known as Guy Noir “Blanche.” Sometimes, looking at her often quizzically sad expression, I recall the name I’d given a stray long-haired hamster taken in over a decade ago (yes, found on her back, lying in the gutter after I’d parked my car and nearly run over her: how she got there was always a mystery) who became Bertha deBlooze. I suppose 10 years is enough time to allow a name to be recycled. 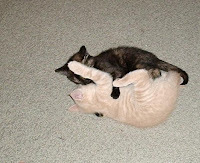 On the other hand, watching the tortoise-shell and the cream tabby wrestling away, perhaps Yin & Yang might be better. So last night, I went out and got one of those “Cat Condos” – my other cats have one they’ve ignored religiously for the last 9 years but as soon as I brought this in, two of the Big 3 were in and out of it in 30 seconds. 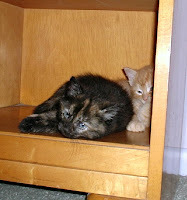 The kittens, however, took a while to get the hang of it. This afternoon, I managed to catch Charlie & Blanche sharing a quiet moment, meatloafing on the roof, but pretty soon it was a rowdy game of King of the Condo as all five of them threw themselves into the game. While every Day could be Cat Blogging Day at Le Maison du Chat, the kittens are well into the “leaps and bounds” stage, now loose full time in the master bedroom (as if I didn't know already who's in charge here) and fully capable of going from 0 to 60 in 4 seconds. With a camera that takes 3 seconds between pressing the button and the flash going off, I have numerous photos of empty carpet to prove it. The other day, Abel discovered if he throws himself at the side of this old stuffed chair in the corner (which actually appeared in that 1947 photo of my dad playing the Hammond organ in our living room – as I said, my mother never threw anything away), he’s like velcro and can climb up the back of the chair with ease. Here he is (left), having scaled the side of the bed. Abel has become the more adventuresome of the five even though he still hasn't quite mastered the art of eating the adult food Charlie, Blanche and Guy Noir are already enjoying. And there's nothing like a good relaxing rest after a hard climb (right). This velcro maneuver does not, unfortunately, work for the highly polished surface of the blonde-wood desk where, much to their surprise, they fall immediately back to the floor, particularly bothersome once you’ve made it all the way to the top of the chair (several kitten-lengths off the ground) and figure you can just throw yourself over onto the desk. Oof! And, by the way, I’ve discovered it does not work well on my legs, either. 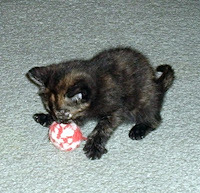 And now they’ve been introduced to their first catnip toys, too. I got them kitten-sized catnip mice, hoping it would keep their minds off the phone cord. It works -- for a while. At one point, after Guy tossed the red catnip mouse, seconds after this picture (left) was taken, a paw suddenly appeared from under the dresser -- Baker, otherwise invisible so far this play period, was perfecting his audition as Thing for the Addams Family musical, and quick as a wink whisked the mouse back into the cave. In a flash, he was gone, mouse and all, and my loud LOL caused the other four to scatter to the four winds (and once again, a picture of empty carpeting). 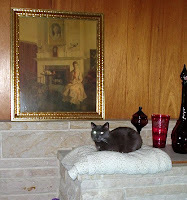 Meanwhile, Murphy, the Russian Blue of the Big Three, a cat I took in as a stray almost 12 years ago, plays the perfect hostess, sitting on the planter by the fireplace, enjoying the relative peace and quiet of the living room. She's been wondering what, exactly, is behind that door: she's met one of the kittens and hasn't seemed overly concerned, but that was before they were going 50mph in a 35mph zone... and little does she know there are five of them! 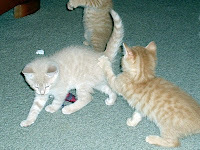 ...and the male Cream Tabby formerly known as Blanche (see left) will now be known as Guy Noir. Though it annoys me to name a dark cat "Blanche," perhaps there's a bit of humor in that, but hey... it's still Guy Noir & his lovely sister Blanche. I had considered Positive and Negative, but then I'm not a photographer (and I have the photos to prove it). I had even toyed with the idea of the "white" one being C Major and the "dark" one F-sharp but then I contemplated how many times I would have to explain where that came from and decided "naaaah..."
Charlie has turned out to be the more adventuresome of these three, though still lagging behind Blanche (formerly Guy Noir) who, the only female, has already circumnavigated the bedroom on her own. 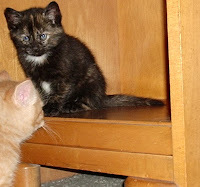 She also discovered this neat cave -- the lower shelf of a night-stand in my parents' old '50s-style blonde-wood bedroom suit: I'm not sure she was all that thrilled that Charlie decided to join her but then she figured, "if you can't pick your relatives, at least you can join 'em." Those three are already quite independent of their mother, Frieda, already eating adult canned food, even the adult dry bits as well as the standard kitten chow. While it's quite a struggle in and out of the adult litter-box, they seem quite proud that they don't have to use the little baking dish set aside for their specific use which they are quickly outgrowing. The other two -- Abel, somewhat, but Baker mostly -- seem reluctant to leave their mother's side and also walk by the dishes of cat food as if they have no idea yet what it is, even if the other three are busy woofing it down. Since that first night I brought her inside, I haven't seen Frieda anywhere but lying behind the toilet, facing either direction (not that the scenery changes that much) or occasionally lying on her side in the Buffet Position. She still hisses at me if I get too close to her but she has sat there hissless watching me play with her kittens and even picking them up and holding them. 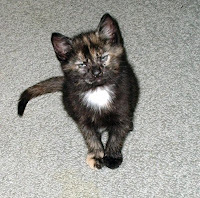 This afternoon, while I was sitting outside the bathroom door watching the kittens play, I saw her start to step out from her corner heading toward the food dishes herself. But she saw me, quickly hissed and disappeared into her lair.